I love you blog! I'm so glad you've posted some new things recently. Great site guys. Keep it up! Hope you have more frequent posts! I wrote a little thing on cute animals and included your blog. How sweet! What tender and warm feelings this photo arouses. There are times when we'd all like to be taken under someone's protective wing and this photo illustrates that need. AWWW.... that's so sweet... I love the way the bird has his wing draped over! truly an awsome picture haha! They make a cute couple!!! Ha ha! This is the best one! look at the mouse's squished up little face ! Ahhhhh they are soooo cuuute!! this is sooooooo beautiful. i love mice awesome! Is this for real, or is it PhotoShopped? Oh my god, SOOOOO CUTE! I want to eat that mouse. That is the most wonderful photo I have seen! Amazing job catching the moment with such skill! So cute!! Lovely photos, thanks so much for sharing them. That is so sweet. Great blog! Great pics! I'd like to link you from my blog. Is it possible to exchange links with you? This Picture is just incredible. Just love it. I just wanted to know, if its allowed to post this picture on www.studivz.net an set a link to this page? a rat is not a mouse and a mouse isnt a HAMSTER ! HAMSTER! IT IS A HAMSTER! READ ABOUT THEM AND LEARN. You shoyld check before the animals type before starting to call it a mouse. they have a size difference. You are having a page about animals and you cant see the difference with a mouse and a hamster. hope the rat will eat the bird! To whoever took the photo... are they real or rather are they alieve and both in the position together or have you stuffed the bird or something or as someone else said photo shopped it? really cute, but these animals look dead or stunned. how else would they end up in these positions? awww this picture is just adorable!!!!!!!!!!!!!!!!!!!!!!!!!!!!!!!!!!!!!!!!!!!!!!!!!!!!!!!!!!!!!!!!!!!!!!!!!!! How Gorgeous, it looks like the little mouse is laughing! 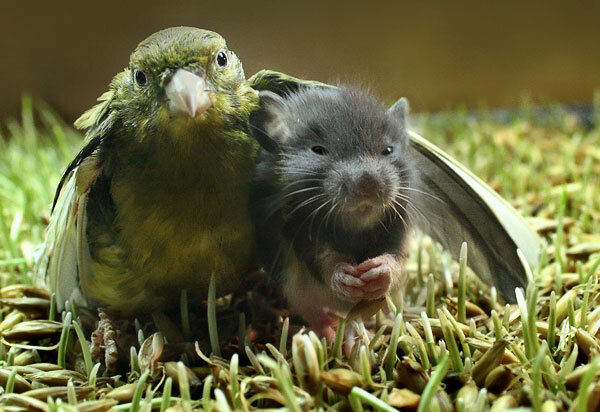 Anybody remember the friendship picturised of a bird and a mouse in the movie "Stuart Little 2"? OMg my brain had exploded from the cuteness of this pic! how cute! this is cute! so amazing and adorable!!! Argh! Cute ickly baby berkshire rittie! And a canary!? Holy cow!!! This is too awesome. Thanks! cute!!!!!!!!!!!!!!! I'm sending it to my freinds and putting your adress on my page! oh my gosh i love this picture! hey can i copy this pic??? haha, he really took the mouse "under his wing." i have no words to explain how beautiful is this blog. i have a blog www.top100-sports.blogspot.com, but it isnt as cute as ur blog, congrats. this is a brilliant pic! Full marks! Awesome! I love your entries. Keep them coming. This has to be one of the most amazing and touching photos I have ever seen. The picture really is cute. But wonder if those animals are real. They look like like taxidermy animals. Very funny, cute and unique. You have carved out a little bit of harmless fun!! how did you get that picture of my uncle floyd and aunt leslie? they are adorable aren't they and so much fun at seed and cheese parties. Are those eyebrows the birdy has raised up?? Wonderfull picture. Love the site. I could just eat that little mouse!! Absolutely adorable! Let's be friends is an awesome blog which I enjoy viewing as often as possible. 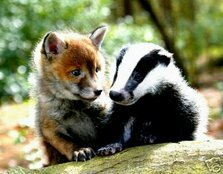 These two animals look like such great pals. This is the cutest photo I have ever seen. How do I see more from this photographer? OMG. This is the cutest picture I have EVER seen. I can't stop smiling. Does anyone know if there's a larger version out there?